This week has been rather an intense one so far, keeping me at the keyboard most of the time, so Iâ€™m quite disappointed that I canâ€™t get into central London today for the launch of International Communications Strategy: Developments in Cross-Cultural Communications, PR and Social Media, a new book by Silvia CambiÃ© and Yang-May Ooi, that has its official premier today. 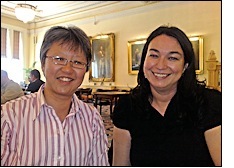 I had the great pleasure of interviewing Silvia and Yang-May for an FIR Interview podcast in July. Listen to that 34-minute conversation for some real insights into their thinking about the book when they were writing it. So Iâ€™m sure todayâ€™s invitation-only launch party is going to be great fun. And although Iâ€™ll miss being there, Iâ€™m going to keep up with some live reporting on the event that Mark Smith, CEO of ipadio, will be doing. Tune in from 6.30pm UK time today. Yang-May says that the live audio feed will be running intermittently whenever Mark calls in on his mobile phone. You can be there without being there. FIR Interview: Silvia Cambie and Yang-May Ooi â€“ July 12, 2009.